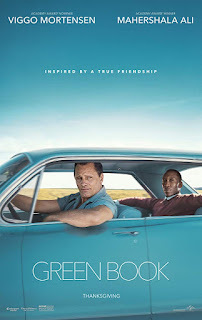 Green Book is an engaging film from start to finish. Yes, it's a statement film, but that message is perfectly balanced with wonderful humour and sentiment, the latter especially true when you consider it is based on true events. It makes its point while also being generally entertaining. A few things are rose-tinted, but it doesn't shy away from addressing all issues, depicting much of the violence and hate of the time. Both Mahershala Ali and Viggo Mortensen give excellent performances, and the music is also beautifully employed in the storytelling. The pacing is good, and this is definitely a film I could rewatch and still find enjoyable. 4.5 stars.